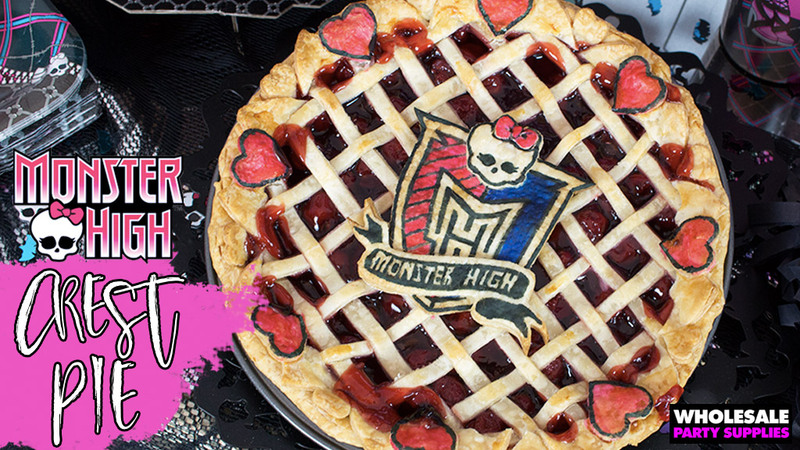 A classic lattice cherry pie gets a special “Monster High upgrade” with the addition of this fully edible pie dough crest. A trim of little bat and heart cutouts complete the charming and delicious addition to our “Monster High Pie Party” buffet! This post and all of the pies have been prepared by our friend Jessica a.k.a. @thepieous on Instagram. 1. Using either pre-made dough, or your favorite homemade batch, prepare a base pie with the filling of your choice and a skinny lattice top. Bake the pie as per your recipe, and ensure the edges are properly protected with a pie shield or foil for the first 30 minutes of baking. 2. 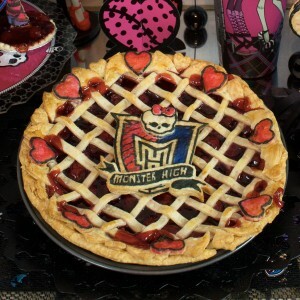 Cut out the bat and heart shapes from your Monster High card stock print out and using a sharp knife, trace out enough bat shapes to go all the way around the perimeter of your pie. To ensure even placement of bats, begin placing bats equidistant on the four compass points, and then fill in from there. 3. Give the bats a brushing of your egg wash and then add heart cut outs to the center of each one, with mini hearts filling in the gaps in between. 4. 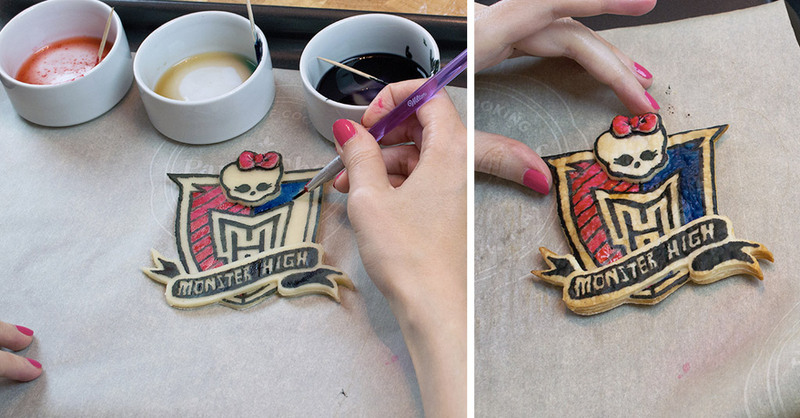 Cut out your Monster High crest from the cardstock and roll out a new layer of dough on a freshly floured work surface. 5. Cut out the main crest outline with a sharp knife and set aside. Using your scissors, cut out the banner and skull shapes from the cardstock crest and cut out these shape in the dough now. 6. Using your egg wash as glue, paste the banner and skull in the correct place on the crest. 7. Transfer the crest to a parchment lined baking sheet. Mix up some black, pink, and blue gel food coloring with a few drops of vanilla extract in small ceramic or glass containers. Using a thin food safe brush, begin outlining the areas of the crest. 8. 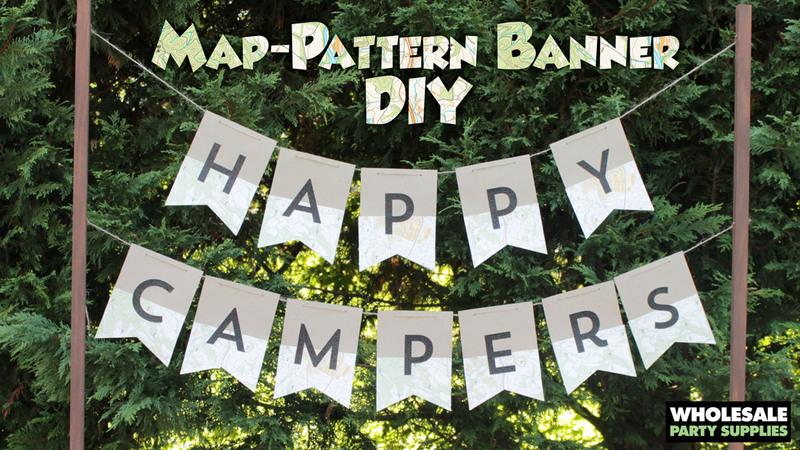 To correctly space out the white lettering on the banner, first create rough square blocks to define the letter areas and get the spacing correct. After this has been completed, begin carefully painting in the negative space that will form the white letters. 9. Let the black coloring fully dry before adding the pink and blue coloring to the sides of the crest. 10. Bake the crest for 7 to 15 minutes, depending on the heat of your oven. The non-colored areas will be a light golden brown when it is ready to come out. Set it aside to cool. 11. Using sugar glue or piping gel, attach the crest. 12. Tint the border accents of your base pie to match your crest, or add colored sprinkles with the sugar glue for the final touch! See what else we’re cookin’ up on Facebook, Twitter, and Instagram! Save this Pretty-as-Pie idea to Pinterest!